Joli Paquet: Let's make some scrappy Valentines! Let's make some scrappy Valentines! Do you have lots of scraps of lace and trims? This project is a great project to use those scraps and make some pretty Valentines! I sewed my Valentines, but you can certainly make this project using your favorite adhesives if you prefer not to sew. Begin by cutting a heart shape out of your canvas or card stock. Then brush a layer of paint onto the heart. And set aside to dry. While your canvas is drying gather your favorite scraps of lace and trim. Cover your heart with glue dots that will help you keep your laces in place while you sew them on. Lay your trims over the heart in whatever manor pleases you. Begin sewing your scraps to your heart. I stitched around and around the heart until my stitches had covered the whole thing. I did my best to go in a heart shape, but as you can see, that didn't always happen and since I was using a light colored thread that was ok.
Once your trims are completely sewed on, you'll want to trim off the excess. I think it is easiest to do this from the back so that you can just follow along with the shape of the canvas. Save those scraps for making more Valentines! Next, since my vintage china doll reminded me of a cherub, I wanted to give it some wings. When I purchased my wings they were a brighter white and I coffee stained them to give them a vintage look. Now to add polka dots, just dip the end of your paint brush in your paint and dot onto your wings! Of course, you can also use Dresden wings, or wings created from paper as an alternative. 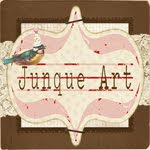 You could embelllish this scrappy Valentine further by adding some vintage millinery, or words. 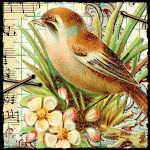 Later today on my blog I will be showing how I used this same technique, and one of my favorite vintage images to make a Valentine pocket for my daughter. 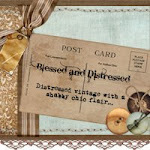 I hope you will have fun with this and use up some of those vintage scraps you're hoarding! Too Cute. 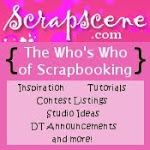 I love how creative you are with scraps! What a sweet Valentine Cerri! Great way to use up all your lace scraps. Oh I love this! What a wonderful way to use up scraps. I have TONS of scraps...I am heading to my sewing machine now to make one of these! LOVE THIS!!!!!! love this-i'll try to make some for my sisters and mom for valentine's day or just to tell them i love them!! What a great idea and thanks for sharing that tidbit about using Ultimate Glue. I'm certainly going to have to try it! I LOVE, LOVE, LOVE this project!!! Love this Cerri! Great idea for using our scraps! Cerri what a wopnderful creation - so achievable by all of us. What a great idea! It's a great solution for all those "practice" pieces of canvasI have saved. great and beautiful project cerri! I am inspired to go make one now!! this is great- thanks for sharing! HI! Thanks for stopping by my blog. my new camera is a Nikkon p80 ~ its a step between a regular one and a fancy DSR camera. I love your tutorials....I am however allergic to the sewing machine...after that green dress in 8th grade.i break out in a rash! LOL!! Great tutorial. I posted a link from my blog today and would like to add a picture of the finished heart to the post. May I use a picture from your blog on my blog? Fabulous heart tutorials, so happy to find you. Thank you SO much for sharing and inspiring! 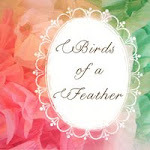 I found you at Patricia's Pretty Paper Hearts Challenge blog.